Another blockbuster by Rolling Stone [see below] raises a basic question of just who the military views as its real enemy -- the threat posed to Americans posed by al Qaeda and the Taliban ... or the threat to the MICC's money flow posed by Congress and the American people. The incident offers an indication of just how desperate the U.S. command in Afghanistan is to spin American civilian leaders into supporting an increasingly unpopular war. According to the Defense Department’s own definition, psy-ops – the use of propaganda and psychological tactics to influence emotions and behaviors – are supposed to be used exclusively on "hostile foreign groups." Federal law forbids the military from practicing psy-ops on Americans, and each defense authorization bill comes with a "propaganda rider" that also prohibits such manipulation. "Everyone in the psy-ops, intel, and IO community knows you’re not supposed to target Americans," says a veteran member of another psy-ops team who has run operations in Iraq and Afghanistan. "It’s what you learn on day one." ... cont. The book launch for The Pentagon Labyrinth will be held at the Officers' Club at Fort Myer in Rosslyn, Va. on March 2, 2011 at 6:00 p.m. Details and directions follow below. You are invited to join us for the release of the printed version of The Pentagon Labyrinth: 10 Short Essays to Help You Through It. The hard copies will be hot off the press and a free copy will be available to all who attend. When: Wednesday, March 2 at 6:00 p.m. until 8:00 p.m.
What: Meet the authors; debate the issues with us, or just enjoy the event. There will be a cash bar and light snacks. At the gate at the entrance to the Fort, ask the guard for directions to the Officers' Club. At the Officers' Club, use the side entrance on the right of the building; go downstairs. If you do not have a DOD or military ID, at the gate your car will briefly be inspected by a polite guard, and your driver's license will be checked. If you are using the Metro, get off the Blue Line at Rosslyn, take the short cab ride to the Officers' Club at Fort Myer; once there, it will be easy to find someone at the event willing to drop you back off at the Metro on the way out. 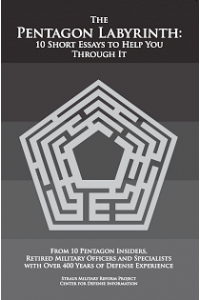 The Pentagon Labyrinth: 10 Short Essays to Help You Through It is a 150 page handbook-guide for both newcomers and seasoned observers to cope with the often byzantine nature of defense issues. The anthology's ten authors bring over 400 years of experience in the military services, weapons design and testing, Pentagon management, budget and cost analysis, defense investigations, journalism, intelligence, military history and congressional national security staff work. 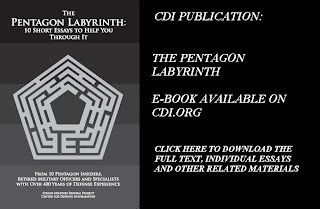 The Pentagon Labyrinth is also available for electronic download at several Web sites, including the CDI Straus Military Reform Project at http://www.cdi.org/program/index.cfm?programid=37 and the Project On Government Oversight (POGO) at http://dnipogo.org/labyrinth/. Israel is becoming a liability to the United States, bringing US into the same international isolation into which Israel itself was cast. The so-called "Israel Lobby", which prevents Israeli misconduct from ever being corrected, is a grave danger to Israel's future. The vote in the U.N. shows the entire world unanimous in regarding settlements in the Occupied Palestinian Territories as manifestly illegal and a major obstacle to any chance of peace. It is clear to the entire world that there is no point to negotiations while the State of Israel is daily creating accomplished facts in the territory which is the subject of negotiations. President Obama and Secretary of State Clinton, too, are well aware of this. They gave unconvincing excuses for their act of imposing a veto on a highly justified and needed resolution, which all other countries supported. These excuses cannot hide the one and only reason for this illogical vote: the intervention of the government of Israel in American politics, using the power of the so-called "Israel Lobby" in the U.S. Congress. ... cont. An America that understands that the settlements are the obstacle should have joined in condemning them. This weekend, a new member enrolled in Likud - and not just in the ruling party, but in its most hawkish wing. Located somewhere between Tzipi Hotovely and Danny Danon, U.S. President Barack Obama bypassed Dan Meridor and Michael Eitan on the right and weakened their position. The first veto cast by the United States during Obama's term, a veto he promised in vain not to use as his predecessors did, was a veto against the chance and promise of change, a veto against hope. This is a veto that is not friendly to Israel; it supports the settlers and the Israeli right, and them alone. ... cont. Flash: In his 13 February 2011 op-ed column, The GOP's defense budget mystery, George Will, a self-proclaimed conservative, who by self-definition, therefore, must favor adherence to the Accountability and Appropriations Clauses of the Constitution, not to mention the rule of law (for example, the Chief Financial Officers Act of 1990), just announced that he has discovered the logical implications of the Pentagon's bookkeeping shambles! "To govern is to choose, always on the basis of imperfect information. If, however, the strong language of [Congressman Randy] Forbes and [Senator Tom] Coburn is apposite, Congress cannot make adequately informed choices about the uniquely important matters that come to McKeon's committee. This fact will fuel the fires of controversy that will rage within the ranks of Republicans as they come to terms with the fact that current defense spending cannot be defended until it is understood." Of course, Mr. Will says nothing about what to do about the Pentagon's bookkeeping shambles that has so recently impressed itself upon his consciousness. He does refer to Senator Tom Coburn's (R-Okla) proposal to freeze the budget until the Pentagon can pass an audit. But, he does not say he supports Coburn's proposal. On the contrary, he hedges his position by saying pompously if Coburn's language is apposite (i.e., if Coburn's language is apt for the circumstances under discussion), Congress can not make an informed decisions about the defense budget. Nor does Mr. Will suggest that true conservatives, who claim to believe in the Constitution, ought to support Coburn's proposal, or any proposal aimed at bringing sanity to the Pentagon's bookkeeping mess. In the end, Mr. Will leaves the reader with an inference that he might support Coburn's idea, but then he might not. Will's reference to Congressman Randy Forbes (R-VA), is peculiar in this regard, to say the least. Forbes, a supporter of high defense budgets, was quoted elsewhere as arguing that, because of the bookkeeping shambles, the Obama Administration could not predict how much its 'efficiencies' would reduce the defense budget, leaving the listener with the bizarre implication that, therefore, Congress should not cut the budget at all! Will's vaguely detached pontifications in the presence of such madness smack of posturing without putting himself at risk by taking a position. Of course, op-eds are -- or should be -- about staking out positions. Why is George Will pumping out pusillanimous mush about a 'defense budget mystery'? After all, it is not as if the Pentagon's accountability problems were unclear and disputable ... The are no "ifs" about the existence of the Pentagon's bookkeeping shambles. On the contrary, the existence of the Pentagon's bookkeeping mess has been understood and acknowledged to exist for almost 30 years. Nor is the seriousness of the bookkeeping shambles a mystery -- just ask Senator Chuck Grassley (R-IA), who as a freshman senator dared to take on a popular President Reagan on this very issue. Grassley demanded that I present the two-hour Plans/Reality Mismatch briefing before a joint open hearing of the Senate Budget and Senate Armed Services Committees in early 1983. Grassley's remarks at the hearing about the seriousness of this issue can be found here. Or ... one might ask where George Will has been for the last 20 years since the passage of the CFO Act in 1990. During that time, Pentagon flunked audit after audit, while it repeatedly pushed the deadlines for compliance with the law further into the future? The goal for compliance is now 2018, or 28 years after the passage of the CFO Act! Or where was George Will when Stephen Friedman, chairman of Defense Secretary Donald Rumsfeld's financial transformation panel, released his report in April 2001 saying that the Pentagon's financial management systems do not provide reliable information that "tells managers the costs of forces or activities that they manage and the relationship of funding levels to output, capability or performance of those forces or activities." ["Transforming Department of Defense Financial Management A Strategy for Change," April 13, 2001, Executive Summary, page i.] The undeniable message in Friedman's carefully chosen language is that unreliable accounting information makes it impossible to link the intended consequences of past spending decisions to the needs justified by the defense budget now before Congress. This is tantamount to saying it is not possible to determine whether or not the internal activities of the Defense Department and its budget are related to the external requirements the Pentagon claims it is preparing for. * Compare the logical ramifications of Friedman's sentence to the wishy-washy position Will takes in his last sentence -- and Will is a man who always tries to impress the reader with his rigorous use of logic, and by extension, the need to act on the implications of that logic. In fact, Senator Coburn's proposal to freeze the budget until the Pentagon can pass a legally required audit is clearly a logical first step -- if only a modest one -- in the right direction. Coburn's reasoning is simple and straight forward, and there is no need to invoke pretentious words like 'apposite' to obscure one's own squeamishness. Last November, a group of working level ex-Pentagonians laid out the reasoning for a budget freeze (again) in an open letter to the Simpson-Bowles Deficit Reduction Commission. The letter explains quite directly why the bookkeeping shambles makes it a national security imperative to support the Coburn proposal, independent of any recommendations by the Commission over whether or how much to reduce the deficit. To put it bluntly, the Pentagon's audit problem is not new; it is not, as the ridiculous cliché-addicted Donald Rumsfeld would say, an 'known unknown.' Yet faced with reality, George Will, ever the courtier in the Hall of Mirrors that is Versailles on the Potomac, positions himself on the fence, as if he was facing something new, conditional, and hard to understand. Over the years, Will has claimed repeatedly to be a defender of the conservative faith in the wisdom of the Founding Fathers, but he exhibits no opprobrium over what is clearly an assault on that wisdom by the Pentagon's open contempt for the Accountability and Appropriations Clauses of the Constitution and the rule of law. James Madison, perhaps the most influential of the Framers of the Constitution, said in a famous letter to W.T. Barry, "A popular government without popular information, or the means of acquiring it, is but a prologue to a farce or a tragedy, or perhaps both. Knowledge will forever govern ignorance, and a people who mean to be their own governors must arm themselves with the power which knowledge gives." At the very least, the spirit of the Madisonian ideal means the Pentagon's bookkeeping system ought to conform to the Accountability and Appropriations clauses of the Constitution and the laws derived from those clauses, so the people's representatives might understand what they are buying with the money they are extracting from people. When conservative 'opinion makers' like George Will fudge this moral requirement (moral because every member of the federal government has taken a sacred oath to uphold and defend the Constitution), can there be any wonder at our nation careening toward a farce, or tragedy, or both? * For new readers, I described the relationship of the bookkeeping shambles to the Pentagon's budgeting practices and the power games for extorting money out of the Congress (and by extension the taxpayer) in my 2002 statement to Congress [here] and how those games contribute to domestic politics that create a predilection for perpetual war or the perpetual threat of war [here]. When American Conservative Magazine and a senior fellow of the Ludvig von Mises Institute collaborate to produce a dynamite article that builds on and reinforces the great work of my friend, the late Professor Seymour Melman of Columbia University, a card-carrying liberal, you know it is time to sit up and read it carefully. Military spending drains and distorts the civilian economy. To get a sense of the impact the U.S. military has on the American economy, we must remember the most important lesson in all of economics: to consider not merely the immediate effects of a proposed government intervention on certain groups, but also its long-term effects on society as a whole. That’s what economist Frédéric Bastiat (1801–50) insisted on in his famous essay, “What Is Seen and What Is Not Seen.” It’s not enough to point to a farm program and say that it grants short-run assistance to the farmers. We can see its effects on farmers. But what does it do to everyone else in the long run? "Industrial productivity, the foundation of every nation’s economic growth, is eroded by the relentlessly predatory effects of the military economy. …Traditional economic competence of every sort is being eroded by the state capitalist directorate that elevates inefficiency into a national purpose, that disables the market system, that destroys the value of the currency, and that diminishes the decision power of all institutions other than its own." GOP Budget Proposals: Perpetual War, Yes. Social Security, No. Politico is an inside-the-beltway newsletter that revels in political gossip — the kind of new media phenomena that reflects the self-inflating, self-referencing character of behavior in the Hall of Mirrors that is Versailles on the Potomac. This outlet receives funding by right leaning contributors, but that said, Politico is a barometer of sorts — in this case of bad ju ju. Note, for example — its description in a recent post of how pressure is building to whack the Pentagon’s budget. It will be interesting to see how the Military-Industrial-Congressional Complex (MICC) will wiggle out of the squeeze described in last few graphs. For what it is worth, my guess is that the MICC will move to protect its hi-tech cold-war rice bowls at the expense of its people and readiness. But we are in the middle of at least two wars — which of course will generate effective counter-pressures, because we “must to protect the troops” — and so in the end very little will happen beyond a few cosmetic swipes. This is one of the benefits of perpetual small wars or the perpetual threat of small wars (explained more fully in my essay, The Domestic Roots of Perpetual War. A more extensive discourse on the MICC’s game will be found in the soon to be released anthology, The Pentagon Labyrinth, which will be freely available in hard copy as well as electronic form). So, get ready for a GOP run on Social Security (and Medicare? ), which conveniently is not even mentioned in the Politico “report.” Obama made Social Security more vulnerable with his recent “temporary” 2% cut in withholding tax. My guess is that little will happen to Social Security in the near term, but the “phony solvency issue” was strengthened by the cut, and we should expect it to be reinforced endlessly in the looming political debate. Liberal economists who recently welcomed Obama’s tax cut by arguing that it will clarify the real “pay as you go” nature of economic debate over Social Security may be in for a nasty surprise. So, without saying so, this superficial report helps us understand how war between the MICC and Social Security is being joined, where the politics of fear (national insecurity versus personal insecurity) will be the weapons of choice. Fasten your seat belt. President Obama says that restoring America’s competitiveness is one of his top priorities. Yet under his watch, deindustrialization, financialization, and globalization continue without interruption. Many advocates of defense spending argue that spinoffs from the Pentagon's R&D and high tech engineering practices are keys to reinvigorating America’s manufacturing economy. For whatever reasons, Mr. Obama shows no intention of reining in defense spending by anything more than a cosmetic amount, even though the defense budget is higher now that at any time since the end of WWII (after removing the cumulative effect of 60 years of inflation), and despite the fact that the United States is spending about as much on defense as the rest of the world combined. Let us hope Obama has not bought into the bogus arguments that spending more on defense will be good for restoring competitiveness in the manufacturing sector of the American economy. Defense spending may be necessary, but it can not be justified on the grounds of increasing general industrial competitiveness. In fact, the so-called spinoffs offs from Defense spending can transmit the corrupting effects of the politically motivated, cost-plus economics of the Military - Industrial - Congressional Complex (MICC) into the larger economy The MICC not only subsidizes wasteful cost growth in the Pentagon, its activities infect the overall economy by soaking up scarce investment and human capital; corrupting the practices of science and engineering; distorting research content on a huge scale; while providing incentives for inefficient production and management practices, (e.g. excessive outsourcing for political reasons - aka the political engineering practices explained here and here), not to mention the politicizing of industrial management. I asked my good friend Pierre Sprey for his opinion. Sprey is a brilliant engineer and a long time critic of defense design pathologies. In fact, I call Pierre the All-Purpose Schwerpunckt because of his wide range of interests, knowledge, and the pithiness of his analyses. He responded in his typical fashion, citing a 5 February report in the Seattle Times to buttress his argument. Moreover, the Times report cites a brilliant internal Boeing Report, written in 2001 by Dr L. J. Hart-Smith, that describes the disastrous economic effects of excessive outsourcing that is now dragging Boeing down. Hart-Smith reinforces Pierre’s points in spades (particularly Pierre's comment about political engineering*), although Hart-Smith’s paper is focused entirely on commercial applications! Attached herewith is Sprey’s diagnosis of Boeing and the effects of defense management practices on Boeing’s competitiveness in commercial markets and the Seattle Times report triggering Pierre's analysis. After reading this, I would urge you to study Hart-Smith's important report. Boeing has been making money on commercial airliners for 60 years by creating and enforcing a wall between their military and their civilian manufacturing divisions. Their latest and largest-ever commercial venture, the 787, has turned into a classic DoD-style fiasco, with huge engineering, quality control, schedule and cost screwups. They have overrun their planned $5 billion investment by a breathtaking $12 to $18 billion. You don't have to be wearing a deer-stalker hat to deduce that the rotten practices bred by DoD procurement have finally infected the executive suite of Boeing's commercial division. The Seattle Times story below lifts a corner of the rug, revealing that the rot began when Boeing merged with McDonnell-Douglas--and when McDonnell executives began introducing the same mindless management techniques that had wrecked Douglas as a commercial aircraft producer. - The simple-minded Harvard Business School style focus on percent return on investment--combined with the executive greed engendered by outrageously excessive compensation geared to stock prices--was at the root of the Dreamliner's initial financial mismanagement and the subsequent years of financial coverup. - Bringing into the Dreamliner team engineers from Boeing's military programs undoubtedly brought in lots of DoD's engineering malpractices: unwarranted avionics complexity; reliance on untested and overtouted composite materials; wishful thinking projections of weight, drag and production cost; use of finite element analysis, computational fluid dynamics and simulation modeling to replace solid hardware testing. In short, the Dreamliner stands as a perfect paradigm of the profoundly negative spinoffs for the U.S. economy of DoD (and NASA) high tech spending--exactly the problem that Ernie Fitzgerald (see The High Priests of Waste) and Seymour Melman (see The Permanent War Economy and Profits Without Production) warned us about over 35 years ago. Boeing commercial airplanes chief Jim Albaugh had some unusually candid comments about the 787's global outsourcing strategy at a recent Seattle University talk. ... which is to morally isolate itself by making enemies faster than it can kill them. If Israel's behaviour continues unchecked, the pro-Israeli biases in and distortions of US policies will intensify our own isolation until something snaps in our polity -- and then, Israel will be all alone. IMO ... Israel's only constructive option is to do a grand strategic U turn, which Israel's leadership steadfastly refuses to do. On the contrary, it shows every sign of digging itself deeper into the self-destructive bunker mentality described by M.J. Rosenberg below. Those of us in the pro-Israel, pro-peace camp do not enjoy being proven right — although we invariably are. Our standard recommendation to Israel is that it should move quickly to achieve agreements with the Arab states and the stateless Palestinians before it is too late. Are Republicans or Democrats Better for the Economy? This is my last post as guest blogger for Jim Fallows and I want to thank Jim and Justin Miller [of the Atlantic web team] for the wonderful opportunity to be a guest blogger. It has been a fun gig, but quite frankly I am running out of steam. But life is an interplay of chance and necessity, and serendipity has just offered up a chance for a final blast. For several years now, I have been in an analytical battle with an official in the Department of Defense over the question of whether Republicans or Democrats are better for the economy. Newk A. Mineshaftgap is the pseudonym of a senior career official in the Pentagon, with a civilian rank comparable to that of a general in the military. He must remain anonymous for policy reasons -- to borrow from the insightful reasoning used by President Merkin Muffley in Dr. Strangelove, Minesthaftgap cannot get into a policy fight, because he works in the "the war room." I can tell you this: Newk has a PhD in physics, but he is not a geek. In fact, he is a bit of polymath, with wide ranging interests, including nuclear weapons, ballistic missile defense, battleship and tank design, global warming and carbon default swaps, economics, and the development of metrics for measuring the quality of medical doctors. I have known Newk for about 20 years and consider him to be a good and most interesting friend with solid if somewhat eccentric instincts. Politically, I would categorize Newk as an independent with libertarian biases. So, as my last blast, let me offer the following link [PDF] to Newk's latest report on whether Republicans or Democrats are better for the economy. For a knuckle dragger from the Pentagon, his conclusions might surprise you. 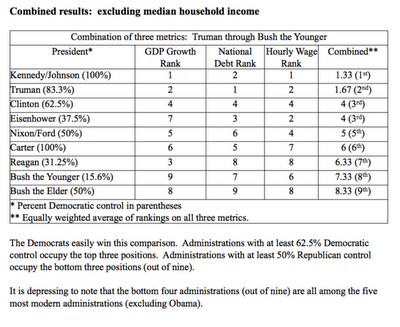 [Jim Fallows note: Here's one sample from the paper, a chart on overall economic performance during post-World War II presidencies. Click for larger and more legible version. The percentage figures -- eg, "Clinton (62.5%)" -- are weighted calculations of how much control Democrats had of government policy during a given Administration. One hundred percent means that the Democrats controlled the White House and both Houses of Congress through the entirety of an Administration, as was the case for both John Kennedy and Jimmy Carter. Zero percent (which did not occur in this period) would mean complete Republican control of the White House, the Senate, and the House. A party gets 50% for holding the White House, and 25% for control of each House of Congress, pro-rated for years of control. For further details, check the paper, where you'll see many other explanations of how economic well-being should be assessed. Very interesting conclusions indeed. Note: this is a guest blog I posted on Jim Fallows Atlantic blog. One of central causes of the financial meltdown was the lack of transparency in the complex derivatives, like bundled mortgages and credit default swaps. Advocates of global warming would have us to believe that they can construct a transparent carbon emissions trading scheme that will provide market incentives to reduce the emission of greenhouse gases. At the center of this trading scheme is the idea of a carbon credit, which is a generic term for any tradable certificate or permit representing the right to emit one ton of carbon or carbon dioxide equivalent. Think of a carbon credit as property in a free market economy -- Ayn Rand, meet Global Warming. "Attempts to end the chaos inside Europe's emissions trading scheme (ETS) stumbled today when the market reopened, only for minimal trading to take place. "And here's another story, which should make one VERY wary. The person who developed the credit default swap, Blythe Masters from JP Morgan, is also behind the creation of this carbon capture program. Leave it to Wall Street to find a way to extract an economic rent from pollution! The Emissions Trading Scheme (ETS) amounts to nothing more than a privatisation of the commons asset which we call the atmosphere. The ETS would create private property relations over public space. In Europe, it's been a colossal failure. The EU introduced what was known as the Clean Development Mechanism, which was an offset system allowing polluters in Europe to invest in emissions-reduction infrastructure in poor and developing countries and then use the "offsets" to avoid undertaking more costly emission reductions in Europe. The legitimacy of the $100 billion (£60 billion) carbon-trading market has been called into question after the world's largest auditor of clean-energy projects was suspended by United Nations inspectors. Market-based systems are insensitive to equity issues. Fortunately, we'll never get this introduced here in the U.S., because it constitutes an attack on the Appalachian coal regions and Obama has already lost West Virginia and probably Ohio. If he were to try this stuff, he might well lose Pennsylvania in 2012, and he'll be a one-termer." Note particularly Marshall's comment about leaving it to Wall Street to hijack the "commons asset which we call the atmosphere." The economic problem of any commons raises all sorts of squishy intellectual problems, because it is fundamentally about a question of moral values, not property values -- it deals with values we profess to uphold and expect others to uphold. It is ironic indeed that the assault on the "commons" by carbon credits is being spearheaded by those advocating policies to reduce global warming. These people profess to be protectors of the environment. Yet the seminal article on the moral character of the problems in dealing with a commons, i.e., The Tragedy of the Commons, was written by the respected environmentalist Garrett Harding and appeared in Science in 1968. In fact, Hardin's brilliant essay became one of the most important sources of intellectual pressure that led to the emergence of a institutionalized environmental protection movement, with the establishment of the Environmental Protection Agency in 1970! Chuck Spinney retired from the Defense Department in 2003 after 33 years service (bio) and now lives with his wife and dog on a sailboat in the Mediterranean. Egypt is throbbing with resistance. Cairo is cloven between the forces of revolution and those of counterrevolution. Hundreds of thousands of people - on Tuesday, February 1, well over a million - have been streaming each day into Tahrir Square, the largest plaza in the Arab world, located in the heart of downtown Cairo. Army tanks line the streets, helicopters and F16s buzz overhead, and pro-Mubarak demonstrators, many of them hired thugs, bloodied thousands of protesters yesterday in Tahrir and elsewhere. Yet the people keep pushing for Egyptian dictator Hosni Mubarak's unconditional ouster, and not just in Cairo. Alexandria has been convulsed, while Suez, a small city abutting the Suez Canal, has been riven with some of the fiercest street battles between the police and protesters, while workers there have gone on strike, demanding that Mubarak step down from his palace in Heliopolis. In response to rising rage, Mubarak addressed the Egyptian people on Tuesday, February 1, and promised to step down in September, stating that his "first responsibility now is to restore the security and stability of the homeland, to achieve a peaceful transition of power," assuring the crowds that he "was not intent on standing for the next elections" anyway. Madison's Nightmare: How Much Should We Spend for National Insecurity? On 4 August 1822, James Madison wrote a letter to W.T. Barry about the importance of popular education and, by inference, the importance of the relationship of the First Amendment to the task of holding an elected government accountable for its actions. He concluded his opening paragraph, setting the tone for the entire letter, by saying, "A popular government without popular information, or the means of acquiring it, is but a prologue to a farce or a tragedy, or perhaps both. Knowledge will forever govern ignorance, and a people who mean to be their own governors must arm themselves with the power which knowledge gives." 2. To ensure its safety, should the United States always spend at least three times as much on defense as any other nation? So, to the extent that these polls reflect what Madison called popular knowledge and the means for acquiring it, they can be summarized as follows: 64% of the people think the defense budget is "about right" or too small, but only 25% think we should three or more times as much as any other nation, while 58% think we are spending more than any other nation. Let's see how this popular knowledge matches up to reality. Rasmussen's report tries to shed light on this question by saying the total defense budget is estimated to be about $719 billion, but acknowledges that this number does not include veteran's care, which amounts to $124 billion, implying a total of $843 billion. These budget numbers are misleading, however, because they are outlays, and as such, they represent the result of several budgets. Moreover, these numbers are not inclusive. The differences between TOA and BA are technical and small, and most people use BA to measure the size of the defense budget. BA is the amount of money Congress gives to an agency each fiscal year. It can be thought of as the annual deposit in that agency's checkbook. The money in a given year's BA is often spent over a period of years (in the case of a new aircraft carrier, that period could be as long as 10 years), so 'outlays", like Rasmussen is quoting, in a given year, can include BA appropriated from Congress in several earlier years as well as the current year. Debates over the appropriate size of defense budget (often referred to in shorthand as 'spending,' as appears to be the case in Rasmussen's questions) are really about how much BA should Congress appropriate each year. This question of new BA is at the heart of the political issue concerning the Pentagon's contribution to deficit reduction, for example. The appropriate budget total (BA) for the 2011 Defense Department's budget (budget category 051) -- $712 billion -- can be found in Table 5.1 in the historical tables of the current President's Budget (051 outlays appears to the be number Rasmussen is using). 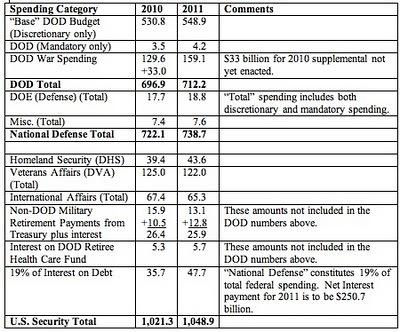 Some additions to the DoD budget are quite obvious and are clearly laid out in Table 5.1. For example, Table 5.1 adds the $18.8 billion appropriated for the Energy Department's (category 053) nuclear warhead program and $7.6 billion for the direct defense related activities of other agencies (category 054). These direct additions yield the President's estimate of total BA for national defense of $738.7 billion, or $20 billion higher than Rasmussen's estimate. This should be considered the lower bound of any estimate for the current defense budget. The Rasmussen report, correctly in my opinion, implies budgets to support veterans should also be included when comparing total US defense budgets to those of other countries. But this addition is only one of many. The table below was compiled by friend Winslow T. Wheeler, who spent many years as a staffer on Senate Budget Committee trying to sort out how much we actually spend on defense. Note that the "National Defense Total" is the same as that in Table 5.1 of the Presidents historical tables. As you can see, the entire picture is quite complex, but adding in indirect defense induced/related budgets results in an annual security budget of just over one trillion dollars for 2011. How Large is the Defense Budget? So, in answering the first question: how large is the current defense budget? Reasonable estimates place it between $739 billion and one trillion dollars for 2011 -- take your pick. According to Rasmussen's poll, 64% of the people think this is about right or too small, and only 58% think this range is more than that of other nations. This brings us to the second question: How does our defense budget compare with the defense budgets of other nations? The most recent estimates for China and Russia, the nations with the next two largest defense budgets, compiled by the Stockholm International Peace Research Institute (SIPRI) are for 2009. If one assumes that recent growth rates continued through 2010 and 2011, and we added in estimates for the effects of inflation, the estimate for China's current defense budget would rise to $125 billion and that of Russia would rise to $69 billion. Bear in mind, these are very rough estimates, but this estimate for China's is higher that that used by Rasmussen, and therefore more conservative in a comparative sense. The people whose opinions are being sampled have good reason to be confused. In fact, their cognitive dissonance reflects a tiny tip of the iceberg that is Madison's nightmare. On 26 January, that farce-tragedy mutated into a comic opera. For years, Pentagon decision makers have admitted, and members of Congress have understood, the Pentagon can not keep track of the money Congress authorizes it to spend, for the simple reason that the Pentagon's bookkeeping systems are an un-auditable shambles. This is an old problem that I, among others, have been writing about since the late 1970s. Auditability and transparency go to the heart of the idea of a representative republic. A government of the people, by the people, and for the people must be answerable to people. Yet to date, the Pentagon has been unable to comply with the requirements of this law. I testified about this problem many times to Congress -- and I refer interested readers to my last statement to Congress in June 2002, which pretty well summed up this mess, describes its ramifications, and describes one pathway toward fixing the problem. My sources in the Pentagon tell me the situation is worse today than it was in 2002. The Pentagon leaders in successive administrations have addressed this problem by urging patience, telling Congress repeatedly the Pentagon has a plan in place to solve the audit problem. That is true, the Pentagon does have a plan, but it is what we in Pentagon used to call a 'cape job', because decision makers in successive administrations keep moving its deadlines further into the future. Obama's Pentagonists are just the most recent in a long line of snake oil peddlers. John Hamre, the Comptroller and Deputy Secretary of Defense during the Clinton Administration, for example, promised to fix the problem by 1996. After a couple of stretch outs in the Bush Administration, Obama's minions are continuing the scam by 'promising' to "fix" the problem by 2017 or 2018, long after they are forgotten in the dustbin of history. Twenty years after passage of the Chief Financial Officers Act, only one conclusion is possible from the repetitive charade: either the Pentagon's leadership is not competent to fix the problem or, more likely, it does not want to fix it. As I explain here and in the Domestic Roots of Perpetual War, there is good reason to have a bookkeeping shambles. It serves a useful, if nefarious, purpose: think of it as a kind of intellectual grease that keeps the money flowing throughout the Military - Industrial - Congressional Complex (MICC) -- a lot of people are getting rich, building careers, and accreting power out of hyping the money flow. While soldiers at the pointy end of the spear and taxpayers are getting hosed, generals are going through the revolving door to big jobs in industry; congressional staffers on defense committees move into high ranking political jobs in the Pentagon, which then gives them a spring board to big jobs with the defense contractors; industry titans move between jobs in industry, the Pentagon, and back to industry; and contractor pac money flows to congressmen. The result is a self-sustaining harmonious circular flow of money through the political economy of the MICC -- what we in the Pentagon call a self-licking ice cream cone. This Madisonian farce-tragedy took a thoroughly comic twist on 26 Jan 2011 at a congressional hearing, where the new, 'pro-defense' Chairman of the House Armed Services Committee (HASC) and card carrying member of the MICC, Buck McKeon (R-CA), signaled his objection to the tiny reductions in the defense budget that President Obama was recommending in the name of improved economic 'efficiencies.' After the hearing, Rep. Randy Forbes (R-VA), chairman of the HASC readiness subcommittee amplified McKeon's signal by invoking a truly bizarre leap of logic: Forbes argued that, since the Pentagon doesn't really know where the money is being spent, then perhaps it should not talk about finding efficiencies! I have a better idea for providing the popular information needed to exit Madison's nightmare: Perhaps the Congress ought to use its Constitutional oversight (as opposed to its 'overlook') powers to force accountability on the Pentagon in the spirit of the Constitution.